French Simmental (also known as Eastern red pied or pie rouge de l’est)are French cattle that originated from the Simmental cattle breed from Switzerland. They are raised for both milk and meat production. Simmental cattle were imported from Switzerland to France at the beginning of the 20th century. The stud book for the breed was opened in 1930. The French authorities tried to cross this breed with Montbeliard during the 1970s, but Montbeliard’s breeders refused. The breed was also crossed with Fleckvieh and Swiss Simmental cattle, and named French Simmental at that time. The French Simmental cattle breed was first bred in Franche-Comte, but now they are found in the Auvergne. Currently there are about 35,000 French Simmental cattle available. French Simmental are medium to large cattle. They are usually red pied colored with a white head and legs and the red is a clear tan. They can be either horned or polled, depending on the genetic breeding history. Generally they have pigment around thier eyes, which is good for preventing problems in heavily sunny regions. 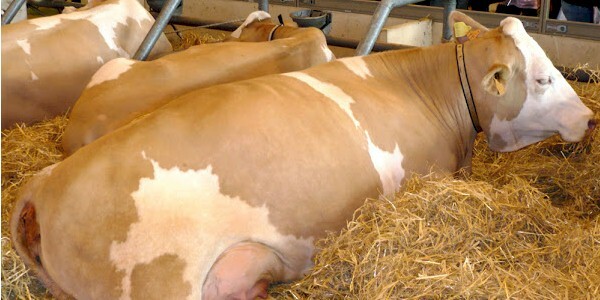 Udders of the cows are well developed and also remain in good health conditions with few common problems. Mature cows are about 140 cm tall at the withers. And average body height of the mature bulls is around 150 cm. The mature cows on average weight around 700 kg. And average live body weight of the mature bulls is around 1100 kg.